4-1/2in. 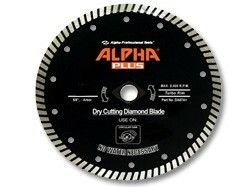 Alpha Plus Diamond Blade - Max. RPM: 13,200. Arbor: 7/8in., 20mm. 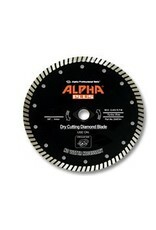 The Ultimate Diamond Blade for Granite Designed for dry cuting applications, Alpha Plus is a premium diamond blade that can be used for cutting granite, engineered stone, marble, and other hard materials efficiently and quickly. Alpha Plus fits on most angle grinders, wet stone cutters, demolition saws, or other common power tools used throughout the stone, tile and construction industries. Stone fabricators, tile installers, masons and general contractors will find that Alpha Plus meets or exceeds all of their needs for various cutting applications in stone, tile and other hard building materials. The high performance design of the turbo edge, which is made with the highest quality diamond grit and matrix, safely provides chip-free cutting and longer life. Whether you are cutting 1-1/4 granite slab or the hardest cured concrete, Alpha Plus is the ultimate diamond blade for your most demanding applications. Tech Tip: Although designed as a dry blade, use in a wet application at high RPM to enhance blade life and cutting performance.